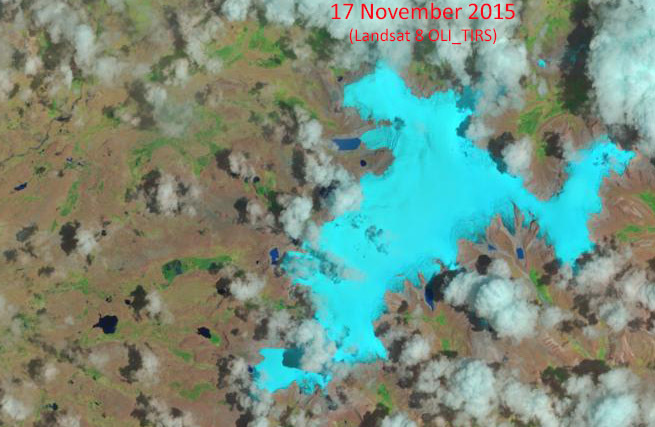 Snowcover last week on Quelccaya was looking rather typical for 17 November (above). However, 2016 is likely to be an unusual year for the glacier, and an important one for our understanding of how El Niño impacts the ice cap's ice core record. The following is a brief overview of how Quelccaya was impacted by two prior strong El Niño events, as well as early evidence for how this current event is already impacting mass balance on the glacier. Documenting the impact of a strong El Niño on Quelccaya Ice Cap in one of the primary objectives of our measurement program, underway since 2003. Comprehensive, high-accuracy meteorological observations at the AWS provide a statistical perspective on Quelccaya's climate at the summit, with which this year's El Niño conditions will be compared. Likewise, our near-annual snow accumulation measurements and detailed sampling for stable isotopes will further help to characterize the El Niño signal. 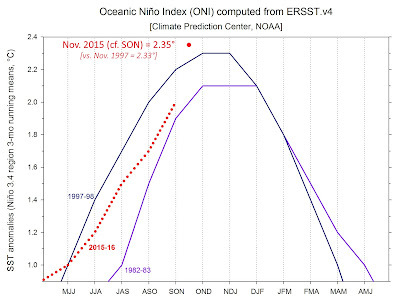 During the 1982-83 El Niño (see figure below), SST anomalies in Niño 3.4 region peaked at +2.1° from November through January, rising from +1.5 for September (i.e., ASO mean) and +1.9 for October (SON). In the dry season following the 1982-83 event, Thompson et al. (1984) report that a snowpit showed a ~30% reduction in precipitation, relative to the average for the previous 8 years. It was during this following dry season that Thompson's team spent ~3 months on the glacier, as "day after day of clear sky" provided solar power for their ice-core drill (Bowen, 2005). For the still-developing 2015 event, three-month anomalies have been consistently higher than those of 1982, yet the ASO average remained lower than during the 1997-98 event. Given the magnitude of recent warming, we may see a 2015 SON average closer to the 1997-98 anomaly. Not known directly from 1983 is the extent of ablation at Quelccaya after the expedition departed in August, prior to the next wet season (cf. 1998 image, below). However, satellite imagery from 7 August and 10 October both show fresh snowcover, which would have inhibited ablation by reflecting a higher proportion of incoming radiation. The summit was visited again the next dry season, when a snowpit was dug through 1983-84 accumulation; whether the pit continued down to re-measure 1982-83 accumulation is unknown. 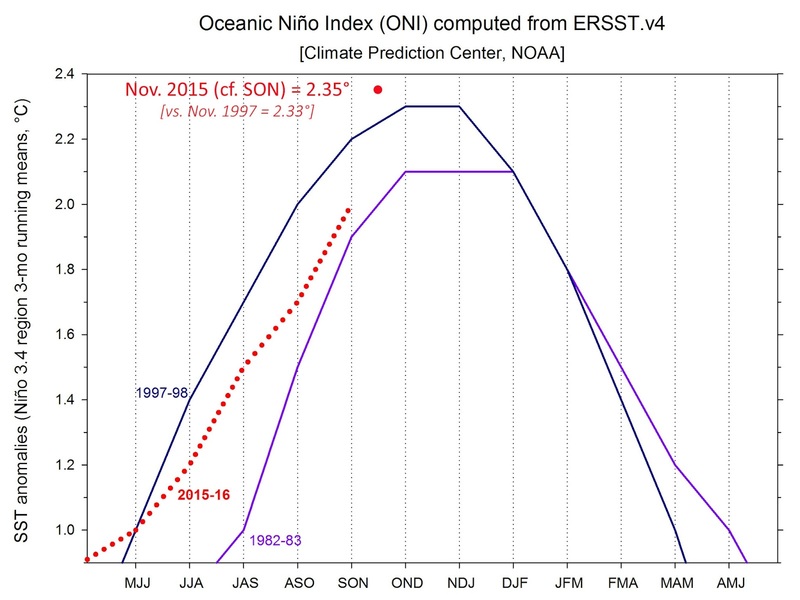 The next strong El Niño, in 1997-98, was the largest event in modern times, persisting longer and with higher anomalies than in 1982-83 (see above). 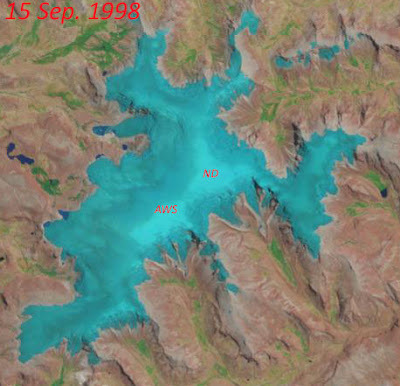 Direct observations at Quelccaya are again not known, yet limited cloud cover in 1998 allowed the Thematic Mapper on Landsat 5 to provide coverage at a regular interval; an animated sequence from 18 Jan. to 2 Nov. 1998 is shown in the right-hand sidebar. Perhaps most dramatic is the 15 September scene, when 97-98 accumulation was restricted to a small area at the summit (see image below, with AWS and "North Dome" drilling site labeled). The next available image from 1998 - two weeks later - shows a thin cover of new snow, which quickly changed the surface radiation balance and effectively ended the dry season. Depending upon when this snowfall occurred within this two-week window, there was either a very thin increment of accumulation added in 1997-98 or - if ablation continued two more weeks - possibly none at all. Could this happen again in 2016? The large-scale dynamics and timing of each El Niño vary, as does the spatial pattern of impacts. Nonetheless, we expect to see generally warmer and drier than average conditions at Quelccaya (e.g., Rabatel et al., 2013), which initial telemetry data appear to be verifying this year. At the moment our available information is restricted to accumulation and ablation, but temperature and humidity data will be back in the datastream shortly. AWS measurements show snow accumulation at the summit beginning towards the end of October, a couple weeks later than average. The latest image, acquired by Landsat 8 last Tuesday (top image), shows fresh snow on the ice cap at all but the lowest elevations (outlet glaciers). An earlier image from 30 September indicates that the transient snowline had risen considerably since our June fieldwork, when we serviced the AWS, measured accumulation, and sampled snow. SST anomalies by June were already at +1.0°, the fourth consecutive month over the +0.5° El Niño threshold. Imagery without extensive cloud cover is not available between the 30 Sep. and 17 Nov. images, but we have very intriguing AWS telemetry data! The colorful graph below below depicts seasonal snow surface height change at Quelccaya summit. Individual hydrologic years are in different colors, with each referenced to the year's minimum height (see Fig. 3 of Hurley et al., 2015 for details). The change in surface height since June is shown as the red dotted line - with 40 percent more ablation than any other year since 2002. This ablation was most likely the result of melting, associated with above-normal air temperature, because at least two snowfall events occurred which only briefly reduced the rate of ablation. A full explanation awaits recovery of additional data. We will continue tracking precipitation at Quelccaya during the 2015-16 wet season, and anticipate obtaining our full set of climate data and time-lapse imagery early in 2016. As the El Niño event concludes, we will visit the summit to further investigate the magnitude of accumulation, and it's impact on isotopic composition. Thanks to Michael Rawlins and Frank Keimig (UMass Climate System Research Center) for help processing telemetry data. Bowen, M. (2005), Thin Ice: Unlocking the secrets of climate in the world's highest mountains. New York: Henry Holt & Co., ISBN 9780805064438 (also available in paperback). Hurley, J. V., M. Vuille, D. R. Hardy, S. J. Burns, and L. G. Thompson (2015), Cold air incursions, δ18O variability, and monsoon dynamics associated with snow days at Quelccaya Ice Cap, Peru, J. Geophys. Res. Atmos., 120, doi:10.1002/2015JD023323. Thompson, L. G., E. Mosley-Thompson, and B. M. Arnao (1984), El-Niño Southern Oscillation Events Recorded in the Stratigraphy of the Tropical Quelccaya Ice Cap, Peru, Science, 226, 50–53.